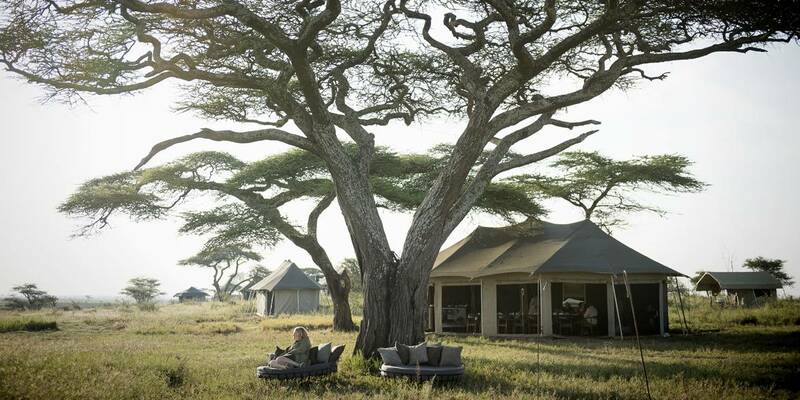 Tucked away in an unbelievably beautiful, remote corner of the eastern Serengeti, closed off to the public for twenty years, Namiri Plains Camp offers a deeper and more intense wildlife experience for safari enthusiasts wanting bush luxury, unparalleled privacy, advanced guiding and an abundance of big cats. 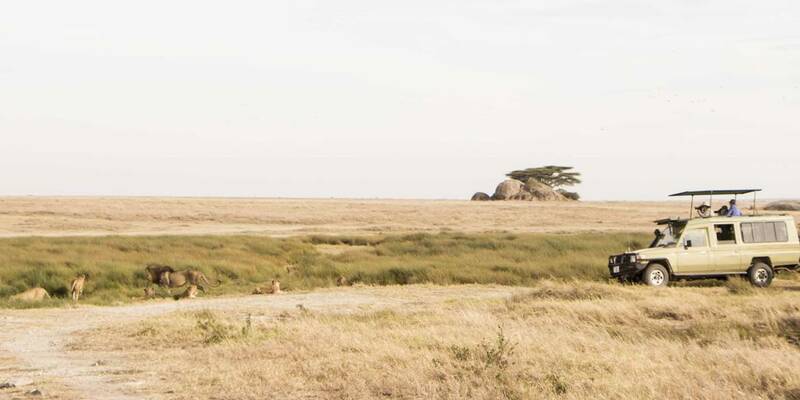 In Swahili ‘namiri’ means ‘big cat’, and the camp is named after the surrounding area that reopened to visitors in 2014 after twenty years of restricted closure to provide extra protection to the breeding population of cheetah. 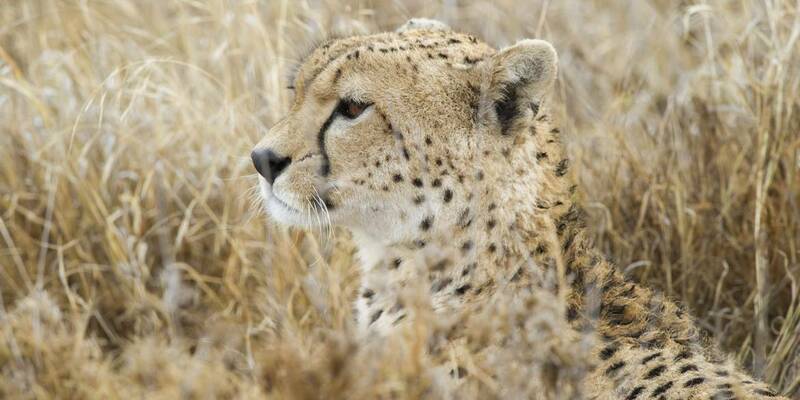 It now boasts one of Africa’s highest cheetah density areas. Namiri Plains Camp undoubtedly offers East Africa’s best big cat viewing opportunities, with the immediate region being home to at least 100 lions, 20 cheetahs and several leopards. 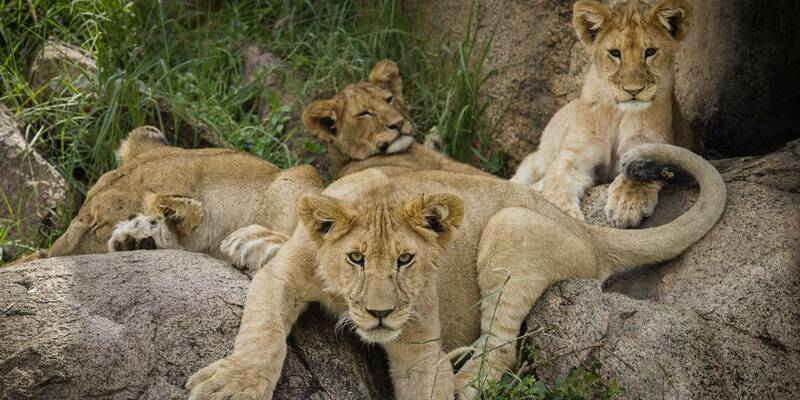 Lions can easily walk through the camp, which even has its own resident lioness that watches from a mere 50 metres away. 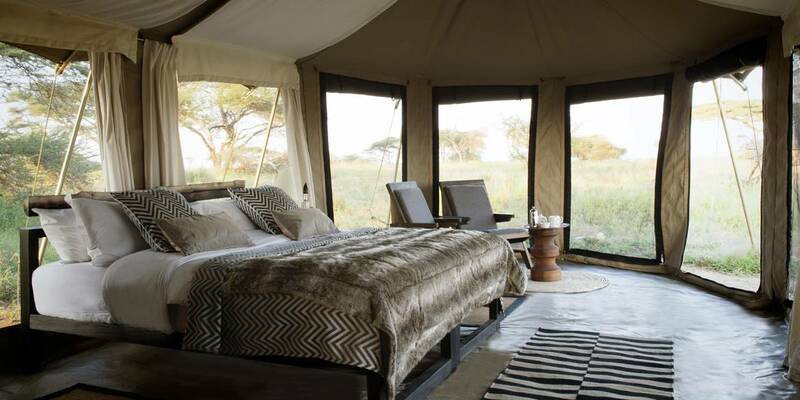 Located in Soit Le Motonyi, this small and exceptionally exclusive camp blends in amongst the acacia forest and grasslands on the banks of the Ngare Nanyuki underground river. This permanent water source supports year-round concentrations of wildlife and guests can enjoy expansive views of the Great Migration crossing the plains and sensational predator sightings. Despite being only 40kms as the crow flies from the Seronera area, and 45 minutes drive to the nearest camp, there’s virtually no other vehicle traffic. 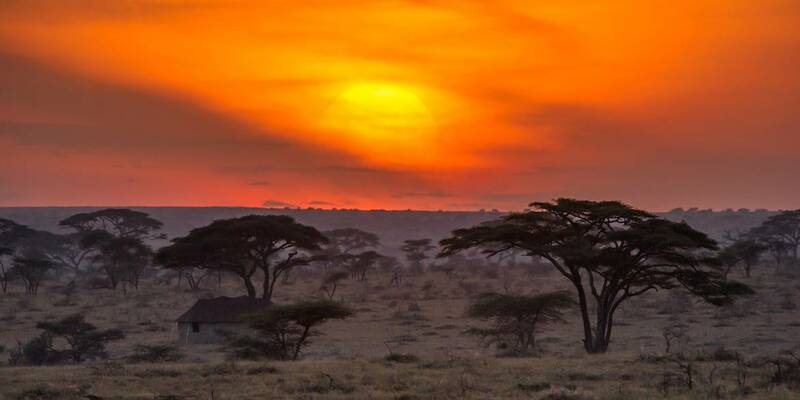 Guests will feel as though they have the Serengeti to themselves. From November to June the Namiri Plains explode into action as the big cats prey on the migrating wildebeests and the savannah becomes a magnet for wildlife. Around 70 larger mammals and over 500 species of birds make this their feeding ground. During the rains this area of the Serengeti is home to some of the highest concentration of hyena in Africa. Never the ones to be too far from the action, clans of up to 30 hyenas roam these parts, scavenging on kills. Daily game drives offer the best opportunity to see wildebeests, zebras, buffalos, gazelles and eland in large herds on the plains; elephants, giraffe and warthog amongst the acacia forests and the predatory big cats waiting in the long grasses for their chance to pounce. It’s also a good chance to see rare species too, such as one of the world’s most hunted animals, the Pangolin. Probably the most intimate way to experience the bush is on a walking safari, when the pace is easy and being at the same level as that of the wildlife heightens your senses. Game walks at Namiri cover the unique flora and fauna of the eastern Serengeti and are accompanied by the Camp’s spear-toting Maasai warrior who doubles as security. Wrapped in traditional red wool robes, the tribesman also escorts guests to their tent after dark. Fossil hunting walks can be arranged along the river’s edge where petrified bones over a million years old have been found. Guests also have the chance to get out into the bush with actual zoologists and researchers themselves which is completely fascinating. 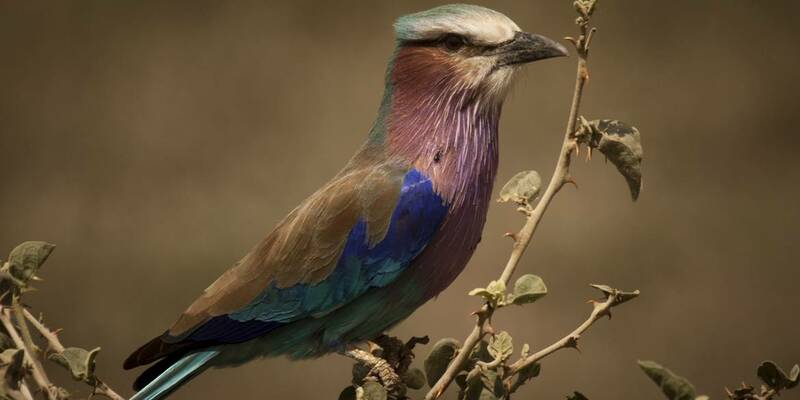 Pitched in the shade of a huge acacia tree, this superbly comfortable camp has a strong emphasis on excellent guiding, gourmet food and friendly yet professional service. As a relatively small camp, the eight large Meru-style tents have been erected in a way as to minimise the impact on the environment, and are spaced generously apart to give an intimate feel to the Camp. Namiri also has a family tent and a honeymoon tent which includes a four poster bed and double shower. All tents have en-suite bathrooms with flush toilet, inside shower and outdoor traditional safari bucket shower with running water. Mesh windows ensure a cool breeze flows through the tent without bringing the insects with it. Unpretentious and relaxing the guest tents have comfy king-size (or twin) beds, armchairs and hammocks. Breakfast can be served on the spacious veranda and if you’re lucky Goliath, the resident elephant, will wander past. Guests can enjoy a sunrise breakfast on top of Soit Le Motonyi Rock before a day’s game drive. Watching the sun rise over the Barafu Kopjes to the east of the camp never fails to impress. Central to the camp are a pair of open-sided tents containing the lounge/bar and dining areas. Large circular sofas under the trees in front of the lounge tent provide a great spot for reading, napping or having a drink. Evenings begin either with a cocktail around the firepit or sundowners with a view on top of a kopje, followed by alfresco dining beneath the towering acacia strung with fairy lights. Post-dinner guests gather for chats around the fire, enjoying a drink and sharing the excitement of the day’s sightings. Guests can also learn more about the research and conservation projects from the resident cheetah researcher. Once back in the tent, a hot water bottle in bed every night is a welcome and comforting touch in this most genially hosted camp.